LinkedIn recently reminded me that it has been two years in my current position. I was shocked, time has flown. As I touched on recently, it has been a whirlwind of an experience as is the nature I imagine of working within a transformational project. The biggest lesson learnt is that in a lean environment (or at least an attempt at a lean environment) you sometimes get stuck doing what needs to be done, rather than what you may prefer to be doing, which in my case is working with teachers and schools. I am currently working on refining a scale-able implementation process associated with student reporting. At home, the common cold came back, again. I swear we had overcome it for this season, but no. Also, new term and new song for my daughter’s school. So I think I am up to 20+ listens of Try Everything from Zootopia. Another great growth mindset anthem. Might also say something about the algorithms at play. I am learning through practice that the easiest way to learn something is to watch and copy somebody else. Scary how quickly our youngest picks everything up. Understanding Mal Lee and Roger Broadie’s point about the young being digitally proficient by the age of three. I attended DigiCon18. Although I went to some interesting sessions and sparktalks, what was great were the conversations in-between. This included discussing the Ultranet with Rachel Crellin, the pedagogy associated to ongoing reporting with Chris Harte, connected learning with Jenny Ashby, parenting and partnerships with Lucas Johnson, implementing the Digital Technologies curriculum with Darrel Branson, purpose and leadership with Riss Leung and direct instruction with Richard Olsen. In other areas, I have been listening to Amy Shark, Florence and the Machine, DJ Shadow, The National and Guy Pearce. I started reading Adam Greenfield’s Radical Technologies. I also updated my site, moving back to ZenPress and adding in a new series of header images developed by JustLego101. 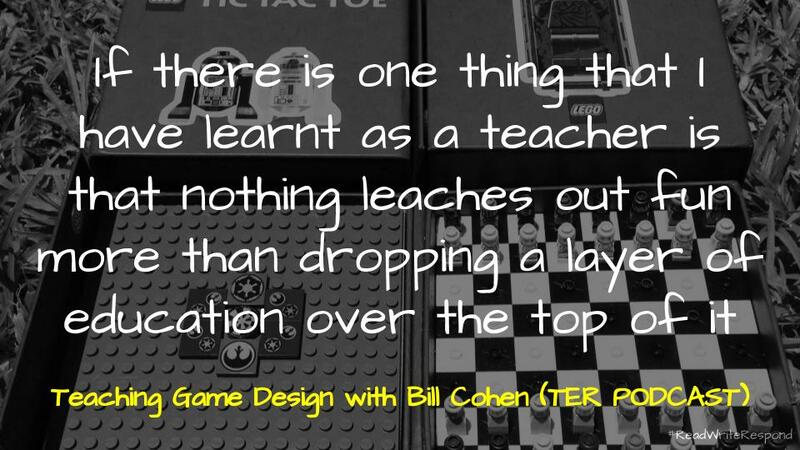 Teaching Game Design with Bill Cohen (TER Podcast): Cameron Malcher interviews Bill Cohen about game-design through play-based learning. Cohen goes beyond the usual coding and computer-aided approaches to focusing on ‘low-tech’ games. This included engaging with board games and outdoor games. This play-based approach focuses on developing clear metalanguage, feedback for mastery and working with an iterative design process. This reminds me in part of Amy Burvall’s notion of ‘rigorous whimsy‘ and BreakoutEDU. Some resources Cohen shared include Boardgame Geek and Lady Blackbird, while in a seperate post, Clare Rafferty shared a list of games associated with History. For a different take on games, in a recent episode of the IRL Podcast, Veronica Belmont and Ashley Carman take a look at gamification in everyday life. Some examples of this include notifications on smartphones, likes and retweets on Twitter or the endorsements on Linkedin. Encountering harmful discourses in the classroom: Ian O’Byrne discusses the challenges of engaging in harmful discourses. He provides some ways to responding, as well as a number of ways to be proactive. This touches on what danah boyd describes as the weaponisation of worldviews. Howard C. Stevenson from Penn’s Graduate School of Education indicates three steps to address these harmful discourses as they enter your classroom. Start with you – Process your own feelings, and address your own vulnerabilities before entering the classroom. Develop a support system with your colleagues. Practice – Classroom reactions usually happen in a split second. Prepare yourself for these instances by role-playing with colleagues in your building, or online with your PLN. After an incident – Resist the urge to condemn the action or content. First try to understand the motivation if is disseminated through your classroom or building. Allow the school’s code of conduct to address instances where students actively spread this information. Strongly explain to students that these harmful discourses and the messages being spread about individuals and groups are not accepted. You will not accept the silencing of voices. Keep talking – After these events, the best course of action is to keep talking. Difficult discussions will often ensue, but children and adults alike need to be able to process their feelings and reactions. This is an opportunity to shut down and be silent, or engage and promote change. How well do we ‘face up to’ racism? : Anna Del Conte provides some take-aways from a course on racism. Some of the activities included what racism is, a timeline of diversity in Australia and listening to stories. Another resource I am reminded of is Dan Haesler’s interview with Stan Grant. In part this stemmed from Grant’s speech addressing racism. Multiculturalism is not an outcome but a process. Racism may not be deliberate BUT anti-racism is always deliberate. Can Reading Make You Happier? : Ceridewn Dovey takes a look at bibliotherapy and the act of reading as a cure. Some argue that readers are more empathetic, while others suggest that it provides pleasure, whatever the particular outcome maybe, reading has shown to provide many health benefits. As Kin Lane suggests, when in doubt, read a book. Zat Rana suggests that this reading is not about being right or wrong, but rather about being open new ideas and lessons. Historic Tale Construction Kit – Bayeux: This site allows users to recreate the Bayeux Tapestry. Clearly this is a great resource for history students, but it is also an interesting approach to storytelling. Two German students originally wrote the Historic Tale Construction Kit, with Flash. Sadly, their work isn’t available anymore, only remembered. This new application is a tribute, but also an attempt to revive the old medieval meme, with code and availability that won’t get lost. 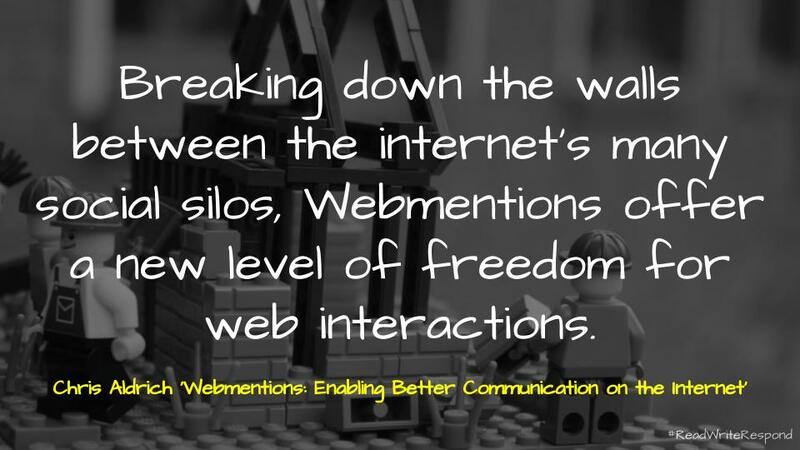 Webmentions: Enabling Better Communication on the Internet: Chris Aldrich provides an introduction to webmentions. This includes unpacking the specification, the notion of mentions, the idea of kinds and way in which sites are potentially able to connect two-ways. 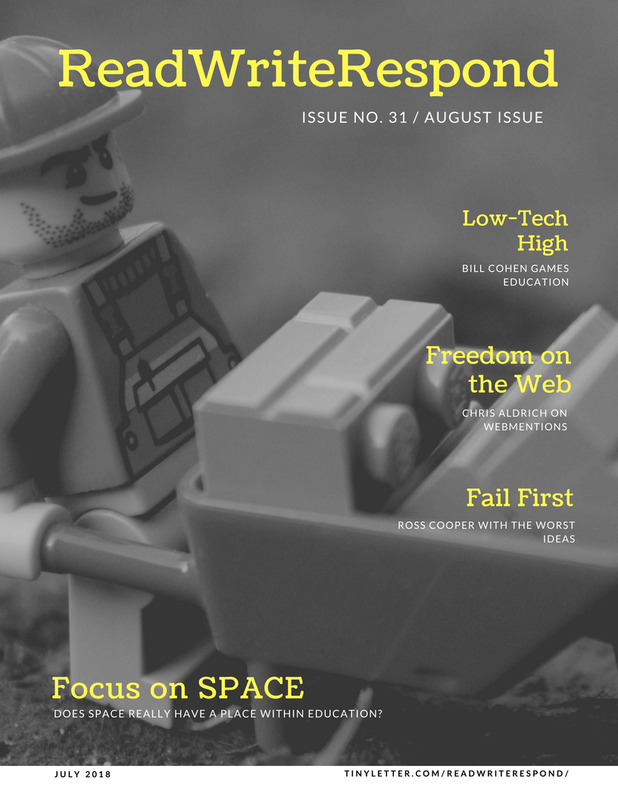 This continues Aldrich’s efforts to document the IndieWeb, which has included a thorough overview of the IndieWeb, the future of feed readers and reimagining academic research. This introduction is different to Aaron Parecki’s guide to sending your first webmentions or breakdown of the oAuth standard. Twenty Years of Edtech: Martin Weller looks back at twenty years of EdTech, highlighting the various moments that have stood out across the journey. This brings together many of the pieces that he has written for his 25 years of EdTech series that he has written to celebrate 25 years of ALT. As he points out in his introduction, we are not very good at looking back. This post then offers an opportunity to stop and do so in a structured manner. Another interesting take on history is Ben Francis’ post on the Firefox OS. 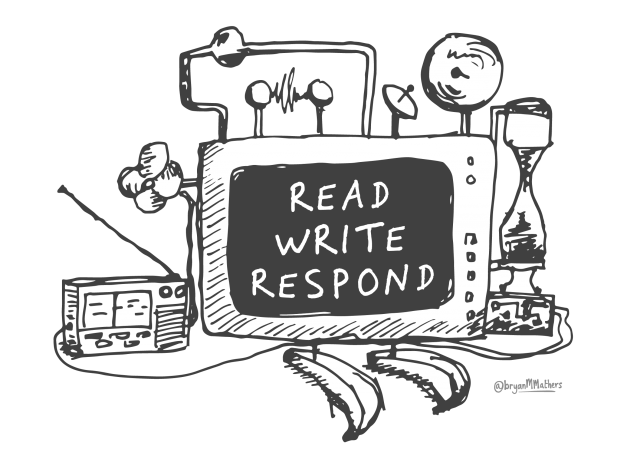 Learning To Code By Writing Code Poems: Murat Kemaldar discusses the connections between coding and poetry. He re-imagines the various rules and constructs in a more human form. This continues a conversation started between Darrel Branson, Tony Richards and Ian Guest on Episode 234 of the Ed Tech Team Podcast about whether everyone should learn poetry and coding. This is also something Royan Lee shares. 18 best practices for working with data in Google Sheets: Ben Collins provides a guide for working with data in Google Sheets. Some of the useful steps that stood out were documenting the steps you take, adding an index column for sorting and referencing, creating named ranges for your datasets and telling the story of one row to check the data. This is all in preparation for his new course on data analysis. Another tip I picked up from Jay Atwood has been to import data, if moving from Excel to Sheets, rather than simply copying and pasting. Zuck’s Empire of Oily Rags: Cory Doctorow provides a commentary on the current state of affairs involving Facebook and Cambridge Analytica. Rather than blame the citizens of the web, he argues that the fault exists with the mechanics in the garage and the corruption that they have engaged with. The question that seems to remain is if this is so and we still want our car fixed, where do we go? Doctorow has also recorded a reading of the article. How the Blog Broke the Web: Amy Hoy reflects on the early days of publishing on the web, where people would handcraft pages and connect them using a contents page. This was superseded by Moveable Type and the chronological blog, subsequently killing off the non-diariest. I was not really engaged in the web back then so it is hard to comment as Jeremey Keith, Duncan Stephen and Kicks Condor have, but it does remind me of the current debates around blogging. I think that all these spaces are forever changing and developing. Sometimes this is based on wholesale changes, but usually people have their own particular reason. Maybe some people will drop off with Gutenberg, but then again sometimes these things have their day. Movable Type didn’t just kill off blog customization. It (and its competitors) actively killed other forms of web production. Are We Listening? : Jose Picardo argues that the question about whether we should have more or less technology in schools misses the point. What matters is how it is used. For example, those who argue for more knowledge often fail to put the effort into actually understanding how technology is used in education. This comes back to the importance of why and having a framework to guide you. For a different perspective on technology in the classroom, read David Perry’s thread. The very teachers who read William and nod vigorously about the need to know stuff before you can understand or do stuff in the context of curriculum are unable to draw parallels between their dismissal of digital technology and their own lack of knowledge about it. Rather than finding virtuosity and pride in learning about how what technology works best and in what context—so as to be able to discern the best tool for particular tasks—we seem happy to eschew whole new toolkits on the dodgy grounds of ignorance and misconception. Throwing Our Own Ideas Under the Bus: Ross Cooper discusses the idea of putting your worst foot forward taken from Adam Grant’s book Originals. This involves trusting the idea at hand and starting with reasons why it might fail. Cooper suggests that this can be useful as it disarms the audience, critique involves effort, helps to build trust and leaves audience with a more favourable assessment. He also looks at this alongside Simon Sinek’s concept of ‘start with why’, highlighting the reason why and the challenges that might be faced. I wonder if the challenge in focusing on the why and why not is about finding balance? This reminds me of Malcolm Gladwell’s discussion of Generous Orthodoxy. As an elementary school principal, here’s the approach I’ve been taking with change: “Here’s what we’re doing, here’s why we’re doing it, and here are some of the ways I will support you!” Now I’ll be toying around with the idea of also proactively addressing the elephants in the room. Furthermore, we should allow for teachers and staff to respectfully and honestly discuss these obstacles, as opposed to us trying to sweep them under the rug. 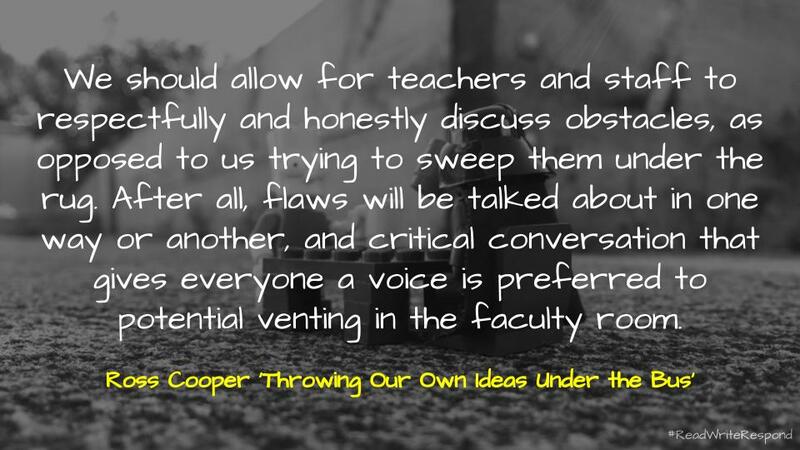 After all, flaws will be talked about in one way or another, and critical conversation that gives everyone a voice is preferred to potential venting in the faculty room. The future will be dockless: could a city really run on ‘floating transport’? : Alex Hern discusses the rise of floating transport, something that I touched on recently with the demise of oBike in Melbourne. Hern captures a number of stories from around the world of hope for efficiency, but also issues associated with shared spaces. I am taken by Hern’s closing remarks concerning reliability over flexibility. This leaves me thinking that sometimes what is required is community and sometimes that involves patience. What is the cost to the public/private transport industry when everyone relies on private personal transport models like Bird or Uber? Ultimately, floating transport is going to have to learn another lesson that conventional transportation bodies have taken to heart: flexible may be fun, but cities run on reliable. i am sorry: Pernille Ripe reflects on life as a connected educator. She discusses the stress, anxieties and perceived responsibilities that come with being an educelebrity. Although we often talk about the technicalities associated with being (digitally) literate, what is sometimes overlooked are the social consequences. This is something that Austin Kleon also recently reflected upon. So it is time for me to step back a bit. To do less work publicly, to share less, to not be so immediately available. To be just Pernille, the person who doesn’t have all of the answers necessarily. That only creates something because she cannot help it. That gives all of her when she is in a public space, but then steps back when she is private. Facebook’s Push for Facial Recognition Prompts Privacy Alarms: Natasha Singer discusses Facebook’s continual push for facial recognition. She traces some of the history associated with Facebook’s push into this area, including various roadblocks such as GDPR. She also looks at some of the patent applications. This made me wonder how many patents actually come to fruition and how many are a form of indirect marketing? Elsewhere, Doug Levin explains why facial recognition has no place in schools, especially the way Curtin University is using it. Cameras near checkout counters could capture shoppers’ faces, match them with their social networking profiles and then send purchase confirmation messages to their phones. The anti-cottonwool schools where kids stare down risk in favour of nature play: This article from the ABC discusses a couple of schools in Western Australia that have reduced the rules on outdoor play. This reminds me of Narissa Leung’s use of old bricks and Adrian Camm’s use of odd material to engage with play. Mr Smith said whereas students would previously come to the office complaining of injury, they are now too busy to make a fuss. “Students are becoming more resilient and getting on with it.” The school has just three rules — no stacking milk creates, no walking on the large wooden spools and no tying rope to yourself. I was recently challenged on the place of space in regards to learning. I recorded a microcast on the topic, but I haven’t had the chance to put all my thoughts together. In the interim, I have collected together a number of posts on the topic. If you have any others to add to the mix, I would love to read them. Imagining Different Learning Spaces: Jon Corripo provided his suggestions for redesigning a classroom space which again sparked my imagination. Flexible Seating: What’s the Point? : Chris Wejr reflects on his experiences in reviewing flexible learning spaces. This includes the reasons to re-design, as well as a series of thoughts associated with the process of re-imagining. Why I Hate Classroom Themes: Emily Fintelman reflects on classroom themes and wonders what impact they are really having on learning. She suggests that our focus should be on how spaces are structured and strategies that can be used to give students more voice. Flexible Classrooms: Research Is Scarce, But Promising: What is interesting about this report is that rather than discussing furniture in isolation, it is considered as a part of a wider conversation about learning and environment. The impact of flexible spaces though can be almost incidental at times, as is with the case of Maths. This speaks of agency as much as it does of the chairs in the classroom. Adding the Learning Back to Space: A reflection on an outdoor learning space and the potential of technology to increase learning and engagement. Benefits of Flexible Learning Spaces #1 Teaching in Teams: Stephen Rowe explains that teachers working in teams is a significant benefit that arises from teaching in an open learning space. Designing Learning Spaces – putting the cart before the horse: June Wall and Jonathon Mascorella define learning environments as a set of physical and digital locations, context and cultures in which students learn. Learning Space Design Inspiration: Steve Brophy collects together a number of ideas and inspirations associated with learning spaces. Beanbags in Space: Matt Esterman suggests that what most teachers want is a more shiny version of what they have, because they are not trained as designers (usually) and are so often hemmed in by the expectations of current reality. 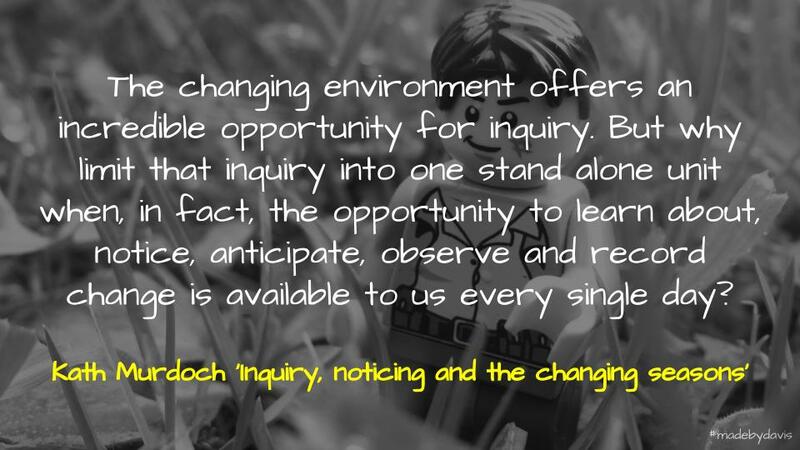 Inquiry, noticing and the changing seasons… A tribute to the late Frank Ryan: Kath Murdoch reflects on the potential of the environment associated with inquiry. Coalescent Spaces: Dave White considers the impact of digital technologies on the creation of coalescent learning spaces. Seeing Spaces: Bret Victor reimagines the makerspace built around tinkering and argues that it is in ‘seeing’ that we are able to make this a science. Communities, Networks and Connected Learning with Google: Technology enables us to easily develop digital communities and networks inside and outside of the classroom. The reality though is that connected learning is as much about creating spaces for learning and building on that. So that is July for me, how about you? As always, interested to hear. Also, feel free to forward this on to others if you found anything of interest, maybe you want to subscribe or buy me a coffee? Archives can be found here.